Join us for another arts-focused Entrees & Insights dinner -- a series of exciting, engaging dinners to support Congregation Shaarey Tikvah. Enjoy an intimate vegetarian-friendly dinner and conversation in the home of Deborah Coleman and Dan Polster in Shaker Heights. 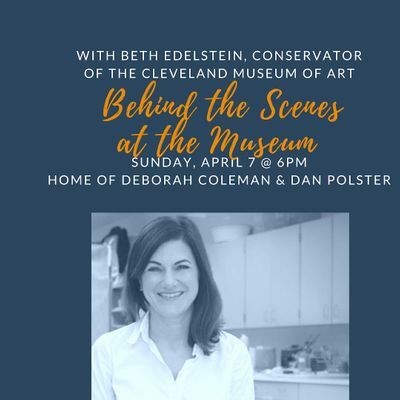 Our featured guest is Beth Edelstein, Conservator, Cleveland Museum of Art and former Associate Conservator at the Metropolitan Museum of Art. Come get a behind-the-scenes understanding of the curation and conservation process of some of the world’s finest works of art. Seating is limited - order your tickets before this event sells out! 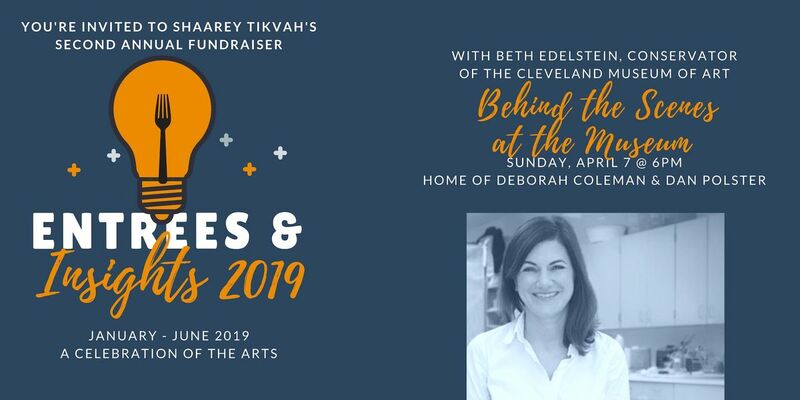 This year’s series includes a number of intimate, home-hosted dinners with special guest speakers centered on the theme, “A Celebration of the Arts.” These fundraising dinners help Congregation Shaarey Tikvah raise vital funds to support the synagogue’s operations – join us for one or all! Everyone is welcome, regardless of affiliation with the synagogue or Jewish community. Following registration, you will receive the address and detailed information regarding payment. For information about other dinners in the Entrees & Insights series, please visit http://www.shaareytikvah.org/new/entrees-insights-2019/ or contact Martha Sivertson at 216-765-8300 ext. 101 or bWFydGhhIHwgc2hhYXJleXRpa3ZhaCAhIG9yZw==.